We are pleased to announce that Varrstoen Wheels are back on our website, with a wide variety of designs available and in aggressive size, these are bound to make you stand out, from the Multi-Spoke styling of the ES1 to the ES8, a 5-Spoke Design with added Rivets to add a touch of flare to your car. Varrstoen cater for all needs, those who want to stand out in the crowd and those who prefer the more subtle, yet stylish approach. Varrstoen produce great value wheels, made with high-quality materials and labour and are very eye-catching. Tarmac Sportz now supplies a range of Varrstoen wheels in a variety of Sizes, Widths, PCDs and Offsets. 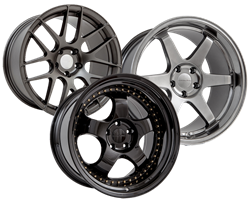 They have a wide variety of designs, from Mesh styling to the Classic Multi-spoke design, there is something for everyone. Here at Tarmac Sportz, we can advise you on what sizes fit which vehicel and we have sold countless number of wheels to a variety of vehicles, including: Audi, BMW, Honda S2000, Honda Civic, Nissan 350Z, Nissan 370Z, Toyota GT86 and many more. From Euro Cars to Japanese Car, there are wheels to suit everyones needs.